How in the world did I end up with six XO laptops in my third grade classroom? I only bought one, back in the original 2007 G1G1. I remember that day well. I was pumped to order one on the first day they were made available, so I was up early. Unbelievably, our cable Internet service was out! Determined, I plugged in a laptop, snagged a neighbor's Internet connection (all in the spirit of international collaboration of course), and ordered one. Thankfully, I was spared from the delivery nightmare suffered by many others - mine arrived just before Christmas, 2007. I soon found I wanted to connect in person with other XO users, and so attended a couple of meetings of the Seattle XO User group. It was a wonderful group of people, but I felt WAY over my head technically. 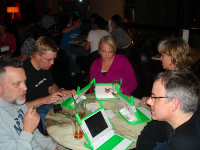 The group may be reforming soon, as I was happy to read in Re-Starting Pacific Northwest OLPC User Groups. In February of 2008 I was presenting at NCCE in Seattle and brought along my XO's, as folks were pretty interested in them. I ended up at a bar one evening during the conference with my three XO's, meeting up with edtech blogger Wes Fryer and his wife, and principal Glenn Malone and his wife. Glenn had bought an XO as a Christmas present for his wife Tami (ahem, grin), and they decided then and there to loan Tami to my classroom for the rest of the school year. So for half of that school year, we had 4 XO's in class. Over the summer somebody left a comment on my blog, saying they loved hearing how my kids were using them, and would I like one more? Jude arrived in the mail from Colorado shortly thereafter. Just before Thanksgiving, 2008, our fifth XO was donated to us by someone who worked in the administration of a local university - a friend of a neighbor who knew about my XO adventures in the classroom. I named it Arbor Heights, in honor of my school, which was at that time threatened with closure. So we had 5 XO's for the 08-09 school year. Our school stayed open, by the way. As the 09-10 school year started up, I was contacted by a local person who had been following my blog and had read about my kids using the XO's. Dorothy was donated in person, which was a first. Until that moment, I had never actually met, or had the chance to shake a hand and say thank you in person to any of the donors. 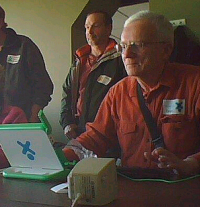 These donors were G2 purchasers, in a sense, giving both of their XO laptops to kids. All of the donations had a couple of things in common. They were not being used, and their owners wanted them to go to somebody, kids preferably, who would use them. To those generous folks, I say thanks once again. And yes, they are being used by kids! So is there a lesson to be learned here? Well, I've learned that sometimes it pays to share your learning and adventuring with others, and sometimes it pays to take a chance. I loved the concept of OLPC when I first heard about it, and I thought having one in my classroom might be a good learning experience. Seemed just about right for 8 and 9 year olds. I look forward to sharing that part of the story.